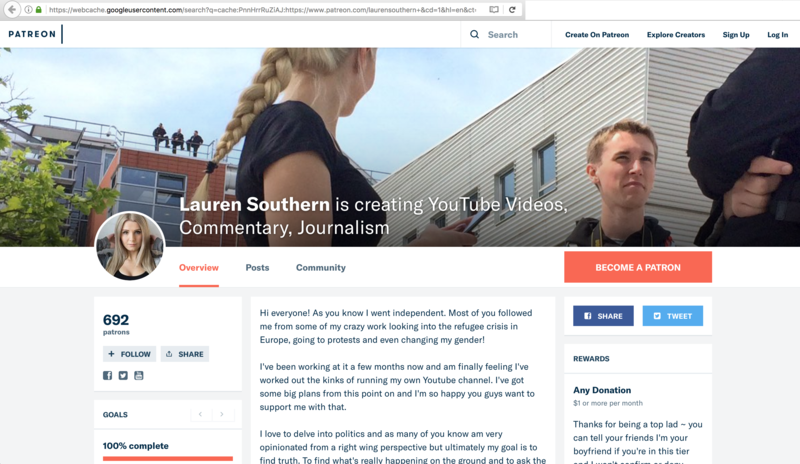 Popular crowdfunding site Patreon has removed conservative media personality Lauren Southern‘s fundraising page, and the reason why will leave you perplexed. 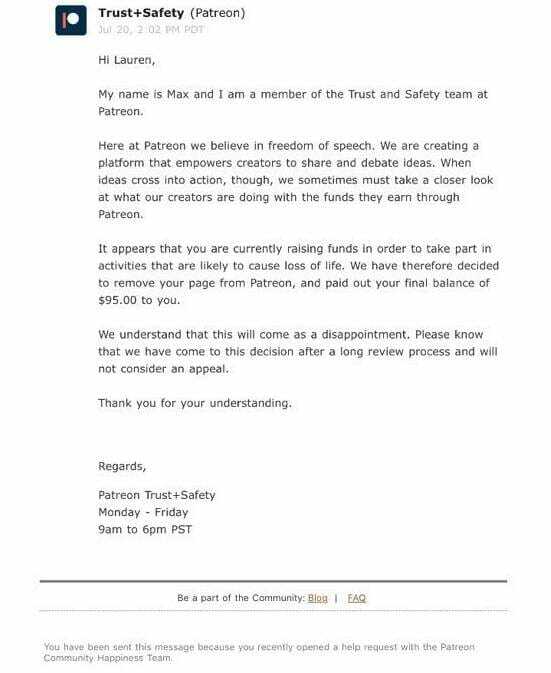 In their official letter to Southern, they claim that her page is “raising funds in order to take part in activities that are likely to cause loss of life”. 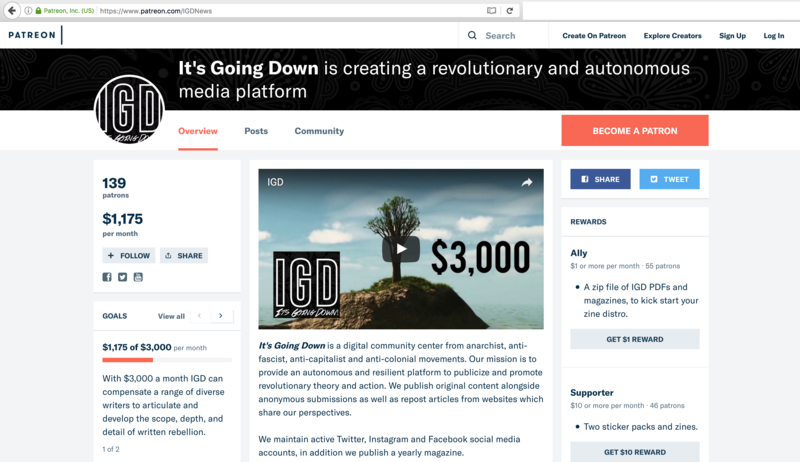 What’s more, the site has NOT removed fundraising pages for violent leftist organizations, such as It’s Going Down, which openly promotes violence against not just Trump supporters, but anyone who isn’t a raging communist. Hi everyone! As you know I went independent. Most of you followed me from some of my crazy work looking into the refugee crisis in Europe, going to protests and even changing my gender! I’ve been working at it a few months now and am finally feeling I’ve worked out the kinks of running my own Youtube channel. I’ve got some big plans from this point on and I’m so happy you guys want to support me with that. I love to delve into politics and as many of you know am very opinionated from a right wing perspective but ultimately my goal is to find truth. To find what’s really happening on the ground and to ask the questions that others refuse to. I have so much freedom to comment on and pursue stories that others aren’t allowed to and I can only do that because I work for you and not a corporation. Hopefully you’ll consider joining the cause of independent media and supporting me! Boy, that *SURE* sounds like a lot of “hate speech” that could possible get someone killed (sarcasm). Meanwhile, you can still donate to her via Bit Coin wallet 1JLM6GJwaPdNv4dM8K5KkcFHeziXXXMGKT and PayPal https://www.PayPal.Me/LaurenSouthern .